Twin Bays House in Scarborough, North Yorkshire sleeps 10 people. Breathtaking sea views of both the North and South Bays can be enjoyed from all rooms in this imposing Grade II listed Georgian town house which is peacefully situated on the headland under the shadow of Scarborough’s historic castle and opposite St Mary’s church, the final resting place of Anne Brontë. Whilst retaining many original features, the house has been refurbished to an exceptional standard, with hand-built oak kitchen, Travertine marble tiles, a magnificent raised bath and spectacular cliff top garden with 180-degree North Bay and castle views, and a hot tub and sauna. Positioned just a 5-minute walk from the heart of the town and a 10-minute walk from the beach, this makes a perfect holiday base for exploring Britain’s first seaside resort with its sandy, accredited North Bay beach, award-winning Sea Life Marine Sanctuary and working harbour with small fishing fleet, and South Beach where there are boat trips around the bay and a great choice of restaurants, bars and traditional seaside stalls. Music lovers can visit the Spa Complex, home of the only remaining seaside orchestra or Peasholm Park which offers open air concerts and a variety of family activities, and the famous Stephen Joseph Theatre, provides excellent evening entertainment. Further north along the Heritage coast lie the smugglers’ coves of Robin Hood’s Bay and Staithes, and the North Yorkshire Moors National Park is easily accessible with its steam railway, quaint villages and stunning scenery. Shop and pub 220 yards. Eleven steps to entrance. Ground floor: Living/dining room with gas ‘living flame’ fire in original fireplace, oak floor and well-equipped kitchen area with hand-built oak cabinets, stone worktop and French doors to the garden. Four steps down to: Utility with toilet. Lower ground floor: Living room with gas ‘living flame’ fire in pewter fireplace and Travertine marble floor. Games room. Double bedroom (for alternative sleeping only). Upper hallway: Fully tiled bathroom and toilet. First floor: Double bedroom with 5ft bed, original stone fireplace and en-suite bathroom with raised bath, walk-in shower, stone wash basin, toilet, Travertine marble floor and North Bay views. Second floor: Double bedroom with 5ft oak bed and South Bay views. Double bedroom with French bed and North Bay views. Twin bedroom with wash basin and South Bay views. Steep stairs to third floor: Play room/reading area with North Bay views. For a better idea of where Twin Bays House is, you can see Twin Bays House on the map below. 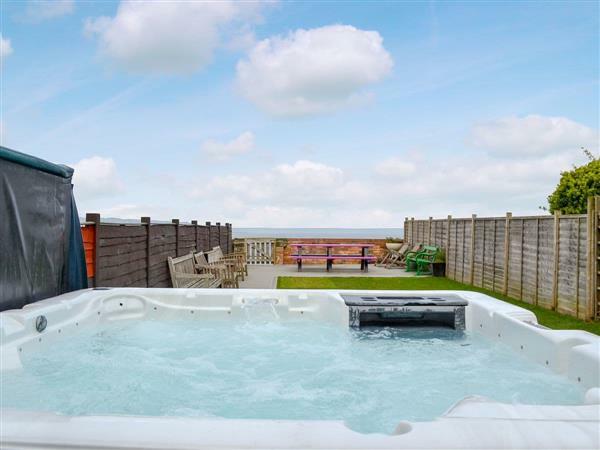 Twin Bays House is in North Yorkshire; should you be on the lookout for a special offer, you can find all the special offers in North Yorkshire. It's always worth checking to see what is on offer at the moment. Do you want to holiday near Twin Bays House (ISW), you can see other cottages within 25 miles of Twin Bays House; have a look to find your perfect holiday location.